During the first 10 years of this century the transsphenoidal (TNS) approach was developed to treat pituitary tumors (Cushin 1932), but the limitations of this route in removing tumors other than pituitary adenomas were soon recognized. Craniopharyngiomas are rarely confined to the sella turcica (Carmel 1985); their capsule is frequently firmly adherent to suprasellar vascular and nervous structures and their consistency is variable, but often quite hard. 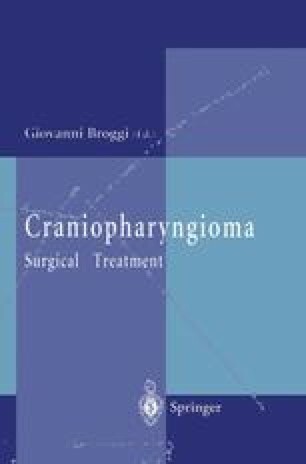 Today, the preferred treatment of craniopharyngiomas is radical surgical removal at the first attempt (Yasargil et al. 1990; Hoffman et al. 1992), and given these premises the question arises as to whether the TNS approach has a role in the treatment of these tumors.